PUBG Mobile Vikendi snow map is now finally playable on Android, iOS. Notably, this is PUBG Mobile’s fourth map addition, following Miramar, Erangel, and Sanhok. To recall, support for the Vikendi snow map in PUBG Mobile was added with the PUBG Mobile 0.10.0 update. 24 hours ago, the PUBG Mobile Vikendi Snow Map download was made available. The PUBG Mobile Vikendi Snow Map download size is 134.2MB on Android and iOS. Right now, Vikendi is available for all PUBG Mobile users. Although at the time of filing this story, it appears that the PUBG Mobile Vikendi snow map is still in beta despite being available for matchmaking. Before you can get the Vikendi map though, you’ll need to download the PUBG Mobile 0.10.0 update if you haven’t already and that has a 2.1GB download size. Compared to PUBG Mobile’s other maps, Vikendi is 6×6 km. This makes it smaller than Erangel and Miramar, both of which are 8×8 km. Though it is larger than Sanhok which is 4×4 km. The Vikendi snow map features icy terrain complete with mountains, open fields, and frozen lakes. There’s even a dino park, a castle, and a giant cosmodrome complete with a rocket and a command centre along with satellites and towers peppering the landscape. Furthermore, the map sports some unique elements. These include an exclusive vehicle, snowmobiles and players can partake in snowball fights on the spawn island before getting into a game. Aside from adding support for the new map, the PUBG Mobile 0.10.0 update brings some interesting features such as the Firearms Finish Upgrade System. This lets players get new cosmetic items such as kill effects and death crate appearances. The arrival of Vikendi in PUBG Mobile makes it the second platform to receive the map after PUBG PC developer PUBG Corp announced it was hitting Steam on December 19. A hotfix for PUBG Mobile was released just before Vikendi was available for download which rectified concerns such as graphics quality and frame rate drops. 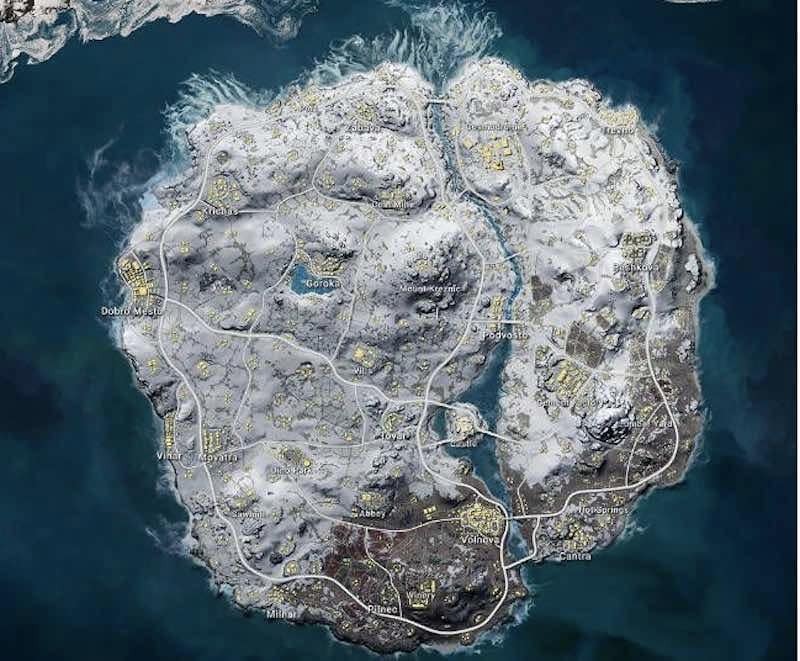 Vikendi: a 6×6 km snow map. The PUBG Vikendi snow map was previously datamined and recreated by YouTuber Allthenewsisgoodnews. This version was missing foliage, but gave us an idea of what to expect when it hits. In retrospect, it turned out to be fairly accurate.